I think Taco Bell®’s breakfast slogan should be “Because if you make the worst decision of the day this early, things can only get better” but the drive-thru screen proclaims going to Taco Bell® as “your best decision of the day” which to me really seems like adding insult to injury. It seems like a few years ago Taco Bell® finally realized that somewhere between 85% and 99.99% of their business goes to drunks and stoners, perhaps best exemplified in a taco where the shell is made out of Doritos®. It seems to be working out well for them, but apparently they’re still catering to drunks and stoners with their new breakfast menu. The problem I see with this is that, even though their breakfast is available later than most fast food breakfast (they go to 11 AM), most people aside from alcoholics, wake n’ bakers, or people still drunk from the night before aren’t going to be in those states of mind that early. Maybe if it went til 2 and was billed as a brunch menu people might have had the chance to get a few mimosas or bloody marys or bellinis or irish coffees or screwdrivers or tequila sunrises or fuzzy navels or whiskey straight out of the bottle or whatever people drink in the morning I ain’t about that life in them. But anyway, I’m not here to review Taco Bell®’s business practices. I’m totally underqualified for that. And besides, it seems to be working out well so far. I went a little after 10:30 on a Sunday morning (I know, that was too late, I didn’t intend to go but I didn’t have any food in the house and if I haven’t eaten I don’t have the strength to fight past my hatred of grocery stores enough to actually go to the grocery store, it’s a catch-22 where the only way out was Taco Bell®) and a huge line of cars started pulling up to the drive through as things got closer to 11 and the end of breakfast. I felt a little sorry for the poor bastards working there but that feeling went away pretty soon. Taco Bell® actually has a surprising number of things on their breakfast menu. I only tried a few because I don’t hate myself that much, but most are pretty self-explanatory. Breakfast burrito? Probably pretty good, it’s a breakfast burrito and they’re always good. Breakfast taco? Probably the same as a breakfast burrito, just folded. OK, now that I’ve reviewed the items I didn’t eat, on to the ones I did. Clockwise from upper left: Waffle taco, Cinnabon Delights, A.M. Crunchwrap. The Waffle Taco comes in two varieties, sausage and bacon. I got the sausage one. If you’ve somehow missed hearing about it or seeing it and somehow aren’t able to imagine what something called a “waffle taco” could possibly be, it’s a waffle folded like a taco, containing a sausage patty, eggs and cheese. Of all the breakfast items, this one definitely looks like it belongs on the late night menu. I could totally see myself…I mean…someone else scarfing down two or three of these at 3 AM. In the cold, sober light of the morning, though, it looks a little suspicious. I tried to go into it with an open mind. After all, the one time I tried McDonald®’s McGriddle® (a biscuit sandwich using miniature pancakes rather than a biscuit), I liked it, and this is kind of the same thing, right? And it’s not like any of these ingredients wouldn’t be eaten together. Maybe not necessarily in the same bite, but like that disgusting kid in the lunch room who always mixed all his food together used to say, it all goes to the same place anyway. I first tried it plain, without syrup. It was OK. The waffle was soft and actually did a pretty good job of containing the ingredients. Adding syrup definitely improved it, though. Unlike the abovementioned McGriddles®, the waffle doesn’t have maple syrup flavor already imbedded in it. And then, on the advice of my cousin who beat me to the “ridiculous review of Taco Bell breakfast” punch, I tried something even weirder, and added hot sauce to the syrup. That’s the right way to do it, hands down. I know it sounds weird as hell, but if (God help you) you ever find yourself eating a Waffle Taco, definitely put hot sauce in the syrup. Think about it, it makes sense: syrup for the waffle, hot sauce for the eggs. Simple chemistry. The Cinnabon® Delights™ are little fried balls of dough, dusted with cinnamon sugar and filled with frosting. I’m not sure if they’re new, but they’re billed as part of the breakfast menu and I’d never tried them before, so I picked some up. They’re pretty good. When you put the balls in your mouth, warm, delicious, gooey white frosting gushes out. If you don’t put the whole thing in your mouth, sometimes some gets on your face and you have to lick it off. And no, there is literally no other way to describe that. They’re super tasty, but I’m not really into sugary breakfast. Honestly, even as sugary breakfast goes these seem way too over the line. They’re actually even sold on the dessert menu later in the day. You might have heard about the A.M. Crunchwrap™ already, and anything you’ve heard is true. I mean, I’m not gonna say angels sang when I bit into it or anything but it was really good. It comes in three varieties: steak, bacon, and sausage. I got the steak one because I’m bougie and also because what is steak even doing at Taco Bell®. 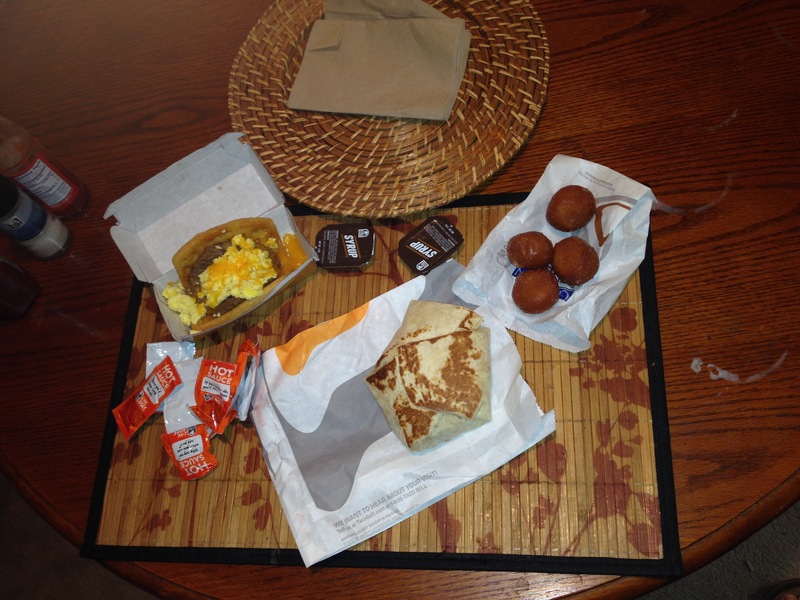 Unless you skipped the rest of the review, you probably know by now I wasn’t too sure about the whole Taco Bell® breakfast thing, even after eating the other stuff. The Waffle Taco was better than I expected, but was it good enough to justify Taco Bell spending millions (or billions? I have no idea how much things cost) of dollars on rolling out a whole new menu, adding coffee makers to their stores and expanding their opening hours into the morning? Maybe not. It’s kind of a gimmick item in all honesty. The A.M. Crunchwrap™, though, is clearly the item that is going to make Taco Bell breakfast a success. In all honestly, it’s probably the entire reason Taco Bell® even considered making a breakfast menu in the first place. Some misunderstood, underemployed genius on the food line came up with it, and the stoners in upper management were so impressed that they actually put down their bongs for a few seconds. And thus the Taco Bell® breakfast menu was born. It was morning, then it was evening, and on the next day the Taco Bell® execs rested and raked in the money, over the bent and broken backs of the working class. OK, so, the A.M. Crunchwrap™ itself. It’s based on the same concept as Taco Bell®’s Crunchwrap Supreme™, which is also pretty good, but the A.M. Crunchwrap™ is smaller and better. It’s filled with eggs, cheese, hash browns(! ), and sausage/bacon/steak, depending on what you chose. If you’re a hot sauce person, put hot sauce on it, if you aren’t, don’t. I am and I did, but it’s good either way. Taco Bell®’s food has never really been the kind you could eat while driving. Tex-Mex or southwestern or whatever the hell it is that Taco Bell® is bastardizing isn’t exactly the neatest food. The A.M. Crunchwrap™ changes all that. I’m a somewhat messy eater, and I was at a table so I wasn’t even being that careful, sometimes putting it down or opening a hot sauce packet or stopping to cry at what I was doing to my digestive system, and only two little bits of egg fell out the entire time. It doesn’t even make sense. They must have hired MIT graduates to work on this thing. Not only is it the least messy item Taco Bell’s ever made, it’s probably the least messy fast-food breakfast item anyone’s ever made. Your precious Chik-Fil-A® biscuits crumble to pieces and get crumbs all over the damn place, don’t even try and tell me they don’t because you lyin’, that’s just what biscuits do. The A.M. Crunchwrap™ is the perfect size to fit in your hand, and it doesn’t make a mess at all. It may not be the perfect drive-thru breakfast item, but it’s as close as our flawed species has come so far, and it may indeed be the closest we ever come. 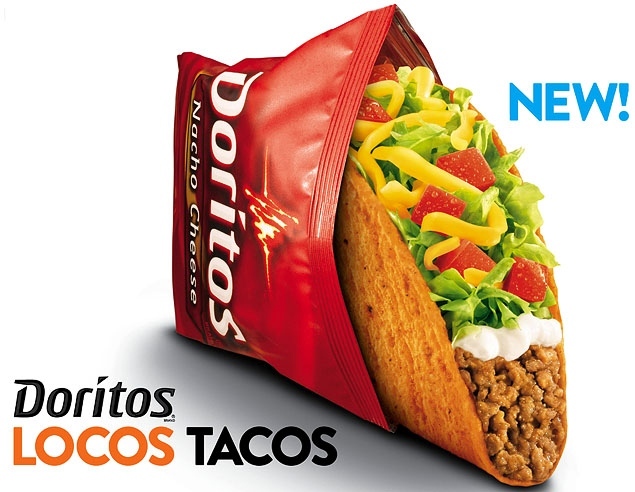 I had of course heard of the Taco Bell Doritos® Locos Tacos for several weeks. Every time I had the same thought: “That is either going to be completely disgusting or completely amazing, and probably both.” I don’t dine at Taco Bell® with the frequency of my younger days (mostly because I don’t live very close to one anymore), so the chance to sample this new dish did not readily present itself. I eventually decided that if I didn’t seize the day eventually it would vanish from the menu (and most likely never return), so one day after getting off of work I decided to try it. I got off around 11pm, which is crucial because it means it was late enough that I was too tired and lazy to go to the store to buy food or make food, but early enough that my girlfriend wouldn’t be home for another few hours so if I needed to throw it up afterwards I’d have time. Pulling into the drive-thru I was struck at how cheap the price was. Usually Taco Bell®’s promotional items are downright pricy (up to $3.50 in some cases! ), but the Doritos® Locos Tacos are only $1.69 for the regular version, and $1.89 for the “supreme.” I have no idea what the difference is between the regular and the supreme, but I figured that I might as well “go big or go home” and go for the full Taco Bell Doritos® Locos Tacos Experience. The price being so low, I considered buying two, but then instead I decided I liked being alive. The cashier at the drive-thru was fairly pretty. I was a little embarrassed to be buying such a disgusting food from her. She gave me extra sauce though, so obviously she didn’t think too lowly of me. Really, thinking about it, it’s not too outside the realm of possibility that I was the best-looking man who’d been through the drive-thru during her shift. This is Taco Bell® after all. The drive home was one of anticipation. I drove quickly, perhaps too quickly, afraid that the culinary masterpiece sitting in my passenger seat would go cold (it did a little, unfortunately). When I got home, I poured myself a glass of fruit juice to go with it so I could pretend that I make good life choices sometimes. I unwrapped the taco. I could see immediately why the price was so low. It’s the same size as other Taco Bell® tacos, which is to say, pretty small. The other thing is that like most other Taco Bell® products, it contains that wonderful weapons-grade tube beef. When I eat at Taco Bell® I usually opt for chicken. It’s a bit pricier, but it doesn’t come from a tube and it doesn’t feel like it’s trying to assassinate you once it’s inside your body. In this case, though, I decided to opt for the beef in order to get the “pure” Taco Bell Doritos® Locos Tacos experience (at least as far as you can use the word “pure” when describing a taco with a shell made out of Doritos®). What distinguishes it, of course, from other tacos is the shell. The shell was the angry orange-red of Nacho Cheese Doritos®, and indeed, taking a bite I could immediately taste the familiar flavor as the shattered bits of corn chip hit the salt receptors on my tongue. There’s also the cheesy aftertaste you experience with Doritos®, as well as a bit of the familiar finger residue (not nearly as much as from actual chips, however). The Doritos® flavor was soon overwhelmed, however, as I began to masticate the contents of the taco. With a normal bite, it was impossible to tell that it had anything other than a plain corn chip shell except for a slight Doritos® aftertaste. The taco was quickly devoured, leaving me still hungry. The fruit juice washed it down nicely.